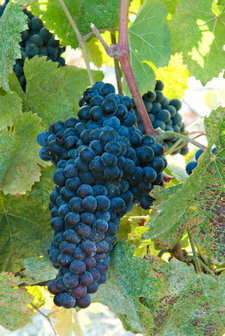 Is it possible that we make the single healthiest California wine? In the last year, we've seen a growing trickle of requests for our Tannat, often from people who are not our typical wine consumers. The most recent of these was a request from a gentleman in Mississippi (which is unfortunately not a state to which we can ship) asking for whichever wine we make that contains the highest percentage of Tannat. Tannat is a thick-skinned grape native to south-west France that makes wonderful dark, dense, smoky wines renowned for their ageworthiness. We imported it to Tablas Creek in 1996 thinking it would be a good blending component. It turned out to be too dominant to play a minor role in wines based on other varieties and as a result we pulled it out of the blends. We have been producing a small amount of one of California's only Tannat-based wines since 2002. Do I think that the Mississippi gentleman is a Basque transplant who has had to leave his sources of Madiran at home? It doesn't seem likely. Neither his nor the other requests we've received ask for wines that have the flavor profile of Tannat. Instead, these requests appear to be driven by recent research suggesting that Tannat is the single healthiest grape to consume. The correlation between red wine consumption and health (particularly heart health) has been recognized for some time, and burst into American consciousness following the 1991 French Paradox broadcast on 60 Minutes. However, the mechanism by which red wine contributes to health has not been well understood, neither why red wine (and not, say, white wine or other forms of alcohol) is so beneficial, nor whether different red wines or different farming or fermentation techniques provide different levels of protection. "The higher OPC concentration in wines from southwest France is due to traditional wine-making, which ensures that high amounts of OPCs are extracted, and to the flavonoid-rich grape Tannat, which makes up a large proportion of grapes used to produce local wines in the Gers area but is rarely grown elsewhere." If thicker-skinned, darker red wines contain more procyanidins, I am not surprised that Tannat should rank at the top of Dr. Corder's list. Its skins are so tenacious that it is often difficult to de-stem, and the wines are dense, dark, spicy and tannic. According to Dr. Corder's measurements, Tannat wines contain three to four times more procyanidins than other red wines such as Cabernet Sauvignon. While making one of California's only Tannats seems enough to put us in the running for healthiest wine in California, I find Dr. Corder's identification of traditional winemaking as a contributing factor to the OPC levels in French Tannats also very appealing. If it is possible, as Dr. Corder asserts, that wines that are less processed, with longer fermentations, less or no filtering and fining, and a minimal reliance on technology exhibit higher concentrations of OPCs, then it's possible that the Tablas Creek Tannat is the single healthiest wine made in California. We're grilling ribs tonight. I think I'll open a bottle of Tannat to celebrate!